So you just got some new ink or you’re thinking about getting some. You’re going to need aftercare lotion (or before tattoo lotion, for that matter)! We’ve got you covered with our lotion for tattoos buying guide. Some of these tattoo lotions are for before you even get any ink, to prepare your skin with the proper amount of moisturizing agents. Let’s look at the things you need to know before you start looking to buy. Petroleum Free: Petroleum is bad for new tattoos. If it’s fresh enough, putting petroleum on your ink can pull the ink right out of your skin. Petroleum-free lotions are made without this chemical. They also tend to be less greasy. Organic: Organic lotions are made with all natural ingredients and avoid any unneeded, harsh chemicals. They also avoid any synthetic ingredients, including scents and colors, and are generally considered to be healthier than non-organic lotions and products. Unscented: Lotions with scents have a tendency to irritate people with more sensitive skin – or more sensitive noses. They also tend to be synthetically added to make the lotions more palatable. It’s fine if your skin can take it! Type: Creams and lotions are not created equally. Lotions are thinner and usually cover a wider area of skin and are meant for protection, while creams tend to be thicker and geared more towards moisturizing than making colors more vibrant. Package Size: This is how big the container is. A bigger container lets you repurchase much less often than smaller containers, so you won’t have the hassle of running out often. Some lotions come in multi-packs as well. Made in: A lot of people want to know where their products are made. If that’s the kind of thing that matters to you, we’ve got you covered. We’ll tell you which of these products is made in the USA. Now we can get to the products! We did a lot of research and reviews to find the best items for our tattoo lotion reviews. We want your ink to look and feel great no matter how new it is! If you’re in a hurry, check out our top pick and budget pick first. If they don’t tickle your fancy, the rest of the list is full of amazing products as well. Let’s get to the reviews! 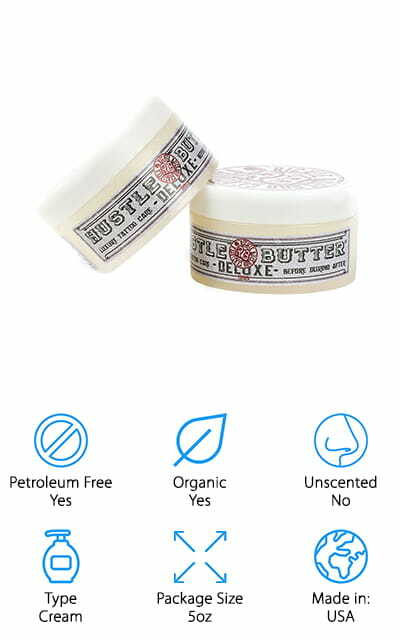 Hustle Butter comes in at the top of our list as the best tattoo lotion for sale, in our opinion. It comes in multiple sizes, including an entire display case if you have a lot of ink that needs protecting! It’s one hundred percent organic, with vegan ingredients. 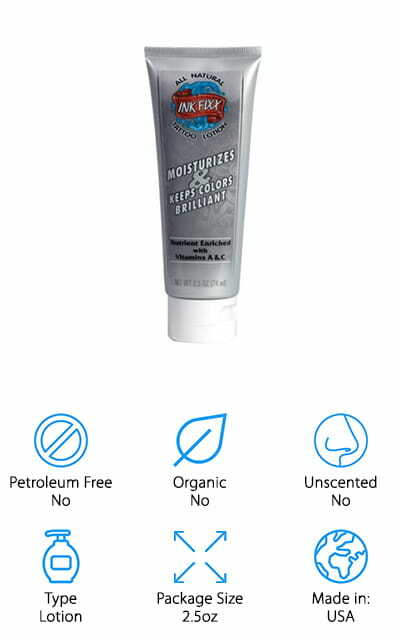 It’s a good replacement for the petroleum-based salves that used to be standard. You can help the healing process and keep in-progress tattoos moisturized and fresh-looking with Hustle Butter. Keep your tattoos looking great no matter when you got it! It’s got a natural, very faint mango scent due to the ingredients in the cream, but it’s not really enough to be overpowering at all. The company boasts that it speeds up the tattoo healing process through a uniquely petroleum-free formula that won’t damage your new tattoo. At the same time, it keeps them moisturized and looking great. We love this tattoo cream, and we’re sure that you will too! 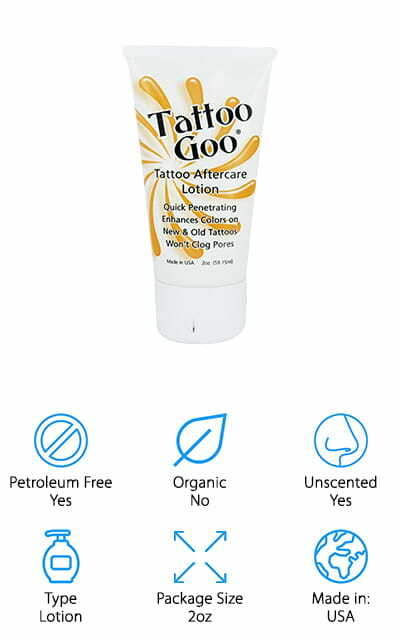 Tattoo Goo Aftercare lotion doesn’t have any petroleum, so your ink will stay where it needs to be. The key ingredient is olive oil for moisturizing and keeping your skin from drying out, which is a major problem with new tattoos. It aids in the healing process by preventing scabbing and reducing the tight itching feeling you often get with a new tattoo. It was developed for people with sensitive skin, so it has less of a chance of irritating your already-inflamed new tattoo. It contains vitamins A&D to restore natural moisture balance. It won’t clog your pores and is meant to help the natural healing process along. It’s pretty safe to say that it’s the best cheap tattoo lotion we looked at in our research. We love that it doesn’t have any alcohol, petroleum, fragrance, or mineral oils in the formula – it’s pure and effective, and comes in a small enough package that you can feel comfortable trying it! Ora’s Amazing Herbal Tattoo Salve is organic and made completely in the USA. There are no synthetic ingredients, fragrances or chemicals. It’s made of herbal oils and completely free of petroleum. 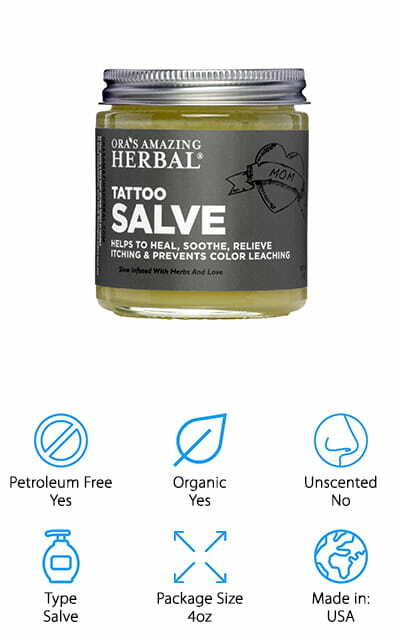 Even after your tattoo is healed, you can use this salve to treat any sort of skin problem, including bumps, burns, and bruises. It’s a perfect salve for all of your ills, and it won’t clog your pores at the same time. Because it doesn’t have any petroleum in it, it won’t leach the color off of your tattoos, no matter how new they are. It’s the best after tattoo lotion for taking care of your ink once it’s finished! It’s scented with rosemary, tea tree oil, and cedar leaf oil – all natural scents that are a byproduct of the way that this salve is made. We love that this tattoo lotion can be used for other things as well, not just for new ink. 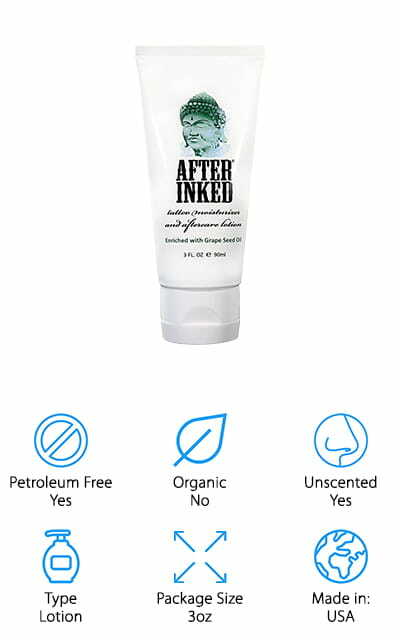 After Inked is a great brand that makes the best lotion for old tattoos that we’ve ever seen. It can be used as a daily skin moisturizer for tattoos no matter when you go them. It’s made completely in the USA, so you can rest assured that you are getting a genuine American product when you buy this lotion. For years, After Inked has been the go-to for professional artists – and it was ahead of the curve all of that time because it is petroleum free! And the best part? It’s not just for traditional tattoos. It can also be used on tattoos that are applied for the purpose of being permanent makeup, like tattooed eyebrows or eyeliners. And you can even use it after a tattoo removal procedure! How amazing is that? Whatever stage your tattoo is at and whatever type of tattoo you have, After Inked’s Tattoo Care Lotion will take care of it! Ed Hardy is another famous name in the alternative world, so of course one of their care lotions made our list. This tattoo lotion is unique because it is made for tanning – and it tans in a way that makes sure that your tattoos won’t fade in the sun. It’s got a bronzing formula that will make your skin look beautifully tanned, to the extreme! It makes your skin feel cool at the same time, so you can tan without being uncomfortably hot or burning. It’s free of oils, so you will tan faster and with less chance of burning under the sun. But the best part is that it has healthful benefits as well, like improving skin elasticity. And it’s formulated specifically because you don’t want your tattoos to fade no matter how long you’re in the sun. 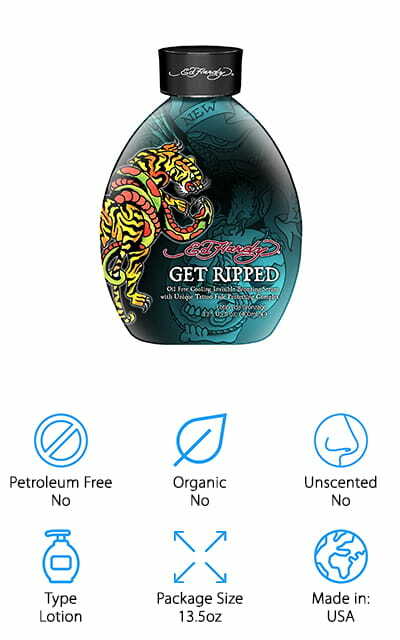 That’s what makes Ed Hardy’s Fade Protection the best tanning lotion for tattoos that we came across in our research. Ink Fixx is formulated specifically for sensitive skin, which is pretty amazing considering. If you have sensitive skin, it’s going to be irritated after getting a tattoo anyway – why make it worse with a lotion that’s full of unnecessary ingredients? You shouldn’t, and that’s where this lotion comes in. Don’t chance your skin getting even more irritated. It’s gentle enough and recommended for use as a daily lotion, and it’s got vitamins A, C, and D to keep your skin looking and feeling great, not to mention your tattoos! It keeps your skin perfectly moisturized and your colors vibrant when you use it four or five times a day continuously. It’s the best lotion to use on tattoos – older ones especially, when you want the colors to remain the best and look just as good as they did when they were new. We love how reliable Ink Fixx is and how much people seem to love it for their skin! 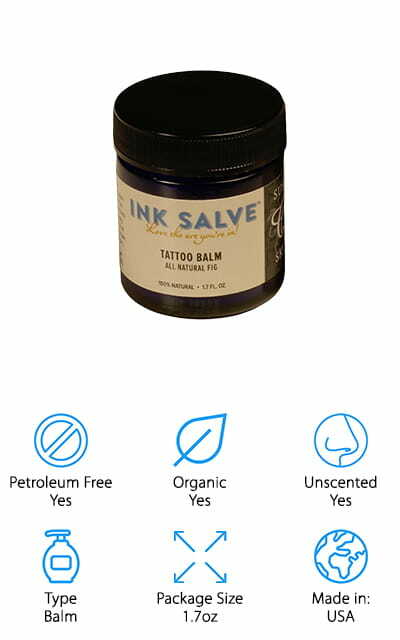 Susie Q Skin Tattoo Salve is petroleum free, unscented, and completely organic, so you can be sure that you’re giving your skin only the best. The one hundred percent natural formula helps the healing process by keeping skin moisturized, by preserving tattoos and boosting the colors that are already present there to bring out the best in your tattoos! Keep your ink looking sharp and vibrant! The essential oils in this formula help to reduce scarring by boosting collagen production, to keep your skin springy and full of the moisture it needs to set your tattoo right. It’s made with coconut oil and beeswax, and it’s not tested on animals. It’s the best unscented lotion for tattoos that is completely natural! For best results, use any time your ink feels a little dry or pulled tight. You should notice a difference due to the essential oils in this formula! We love how natural and moisturizing it is! Pipe Cover makes the best lotion for tattoo care – or one of the best – on our list! You can definitely use this as an aftercare lotion as well as a before care lotion, and a lotion that you can apply as your ink is being completed. They recommend that you start using it for two weeks prior to getting your tattoo so that you get the best results when the ink does hit your skin. It improves the outer layer of skin and makes it more ready to accept the tattoo. You can easily add lighter colors to the tattoo while using this lotion – it tends to be harder when the skin is drier. It works between session to bring you the best tattoo experience. And it’s free of harmful ingredients and full of vitamins and minerals. Your ink will look and feel its best when you use this Piper Cover lotion before, after, and even during your inking sessions. 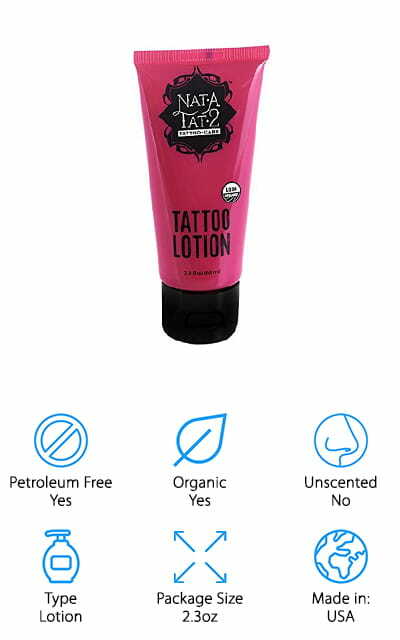 The Nat-A-Tat2 Tattoo lotion is gentle enough to be used as a daily moisturizer and definitely gentle enough to be one of the best lotions for new tattoos that we found in our reviews. It relieves the itching and irritation that plagues new ink, without clogging pores or making your colors bleed. The active ingredients include avocado oil, jojoba oil, and vitamin E – a perfect mixture for balancing and restoring your skin after getting a new tattoo. It helps to reduce the inflammation of the tissue and lower the risk that the tattoo might get infected. It’s one hundred percent organic and vegan, so you’re only getting the purest ingredients for your skin. If you spend the days after your tattoo pampering it, you’ll get the most out of it, especially tattoos with vibrant colors and delicate lines. Help prevent it from blurring later on by taking care of it now! This lotion sticks out for how gentle it is! Barbero’s Care Cream is a good lotion for tattoos because it’s strictly an aftercare lotion. 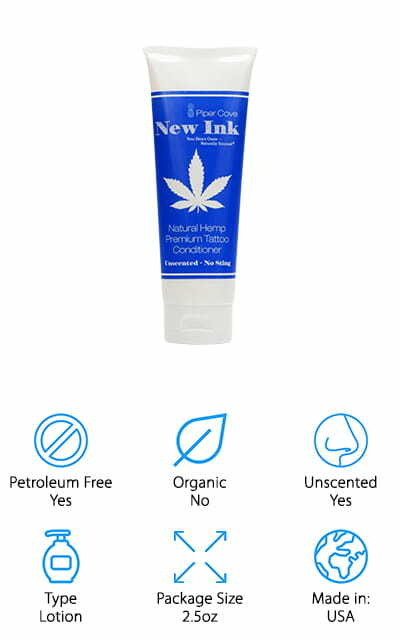 You can only use it after your tattoo is about two weeks old, so it works after the irritation and inflammation has gone down in order to enrich, moisturize, and soothe the skin and your ink. You want your tattoos to look bright, clear, and just as perfect as the day you got them, don’t you? Then there’s no reason not to use this lotion! The cream is heavily moisturized so that you’re passing on a fair bit of that important moisture back to your skin. The formula isn’t greasy, and it’s not going to stain your clothing if you smudge over your tattoo a bit. The best part? This lotion contains a sun filter, so your ink won’t fade if you want to spend the summer on the beach. Apply it after you clean your tattoo to get the best results!